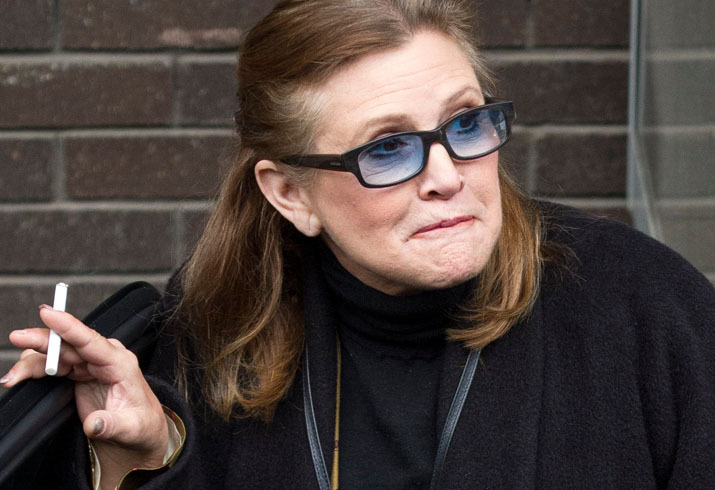 Plus, watch celebrities grieve the loss of the 'Star Wars' actress. As Star readers know, Star Wars actress Carrie Fisher died on Dec. 27 after she was hospitalized for suffering from a cardiac arrest on Dec. 23 on a flight from London to Los Angeles. Now, heartbreaking footage is beginning to surface that show her sad final days, plus how some celebrities are reacting to her shocking death. Carrie was spotted earlier this year in April at the Los Angeles airport, where she claimed Star Wars Episode 8 was going very well. Then in September, Carrie was seen shopping in Beverly Hills with a male companion and her beloved dog — who Carrie's daughter Billie Lourd will now care following her death. She was also spotted sharing a kiss with Star Wars costar Harrison Ford on stage during The Force Awakens Comic-Con Panel. Both stars had fueled rumors that they had an affair during their younger years on set. Carrie caused fans to speculate in previous years that she was still suffering from her long-time drug addiction, especially during a couple of bizarre red carpet appearances in the years leading up to her death. However, celebs haven't stopped expressing their grief after news broke she had died after she laid in the hospital unconcious for four days before passing away. Olympic boxer Eric Kelly was caught on camera, claiming Carrie's passing was devastating to his childhood years. John Savage also came forward to call her a "wonderful" person and express his broken heart in losing her. Debra Messing was at a total loss for words when she was confronted with the news that Carrie had died.